That last point is the main focus of this blog and the recent changes. Take a look at the screen shot below, and notice that the same statement is repeated several times. The current display is nice in that, going from top down, you can see what happened, in the order it happened, in a session. But if these identical statements weren't right next to each other, you might not notice that the statement was repeated. Sometimes repeated statements will appear as the same cursor executed multiple times and sometimes they will be separate cursors, each executed one time. It would be nice to be able to see a summary of these identical statements, regardless of if they were the same cursor or separate cursors. So that's what's done for Toad 13 - beginning with 13.0.0.7. Avg Dep - the average recursive depth of this statement's cursors (it's helpful to sort by this column if you just care about top-level statements). Of course, you can click the column header to sort by any of these columns. OK, enough talk. Here's the same file opened in the new Trace File Browser, with the same statement selected. See how it's listed only once in the top? The numbers you see in that row are totals over all of that statement's cursors. Each cursor for that statement is in the middle section, and whatever cursor you select in the middle is detailed in the bottom. So it's not a huge change in terms of the look of the Trace File Browser, but hopefully it will give you a better understanding of your trace files. I moved the "Query database to decode object ID's" to the top, so you don't have to come back to the Statements tab to turn that on. 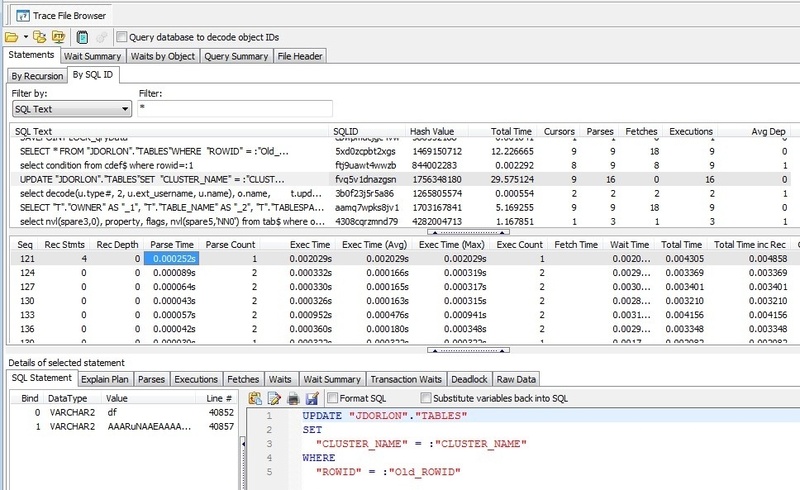 I added "SQL ID" as a filter option, and changed the filter controls so I didn't have to keep adding controls every time we add a new filter possibility. 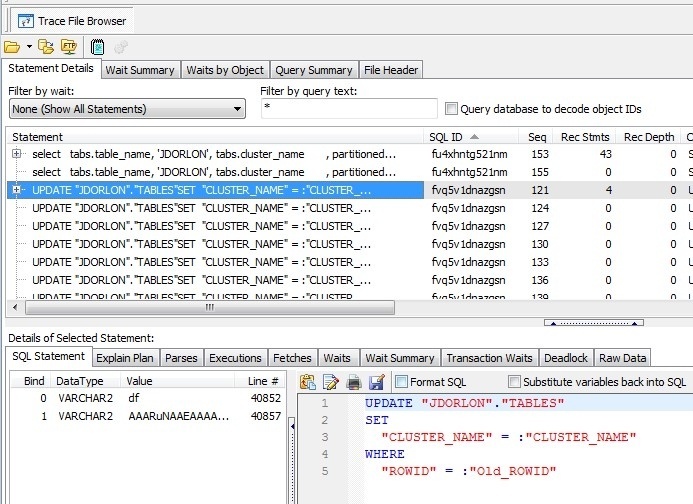 So now you can specify what to filter by (SQL Text, SQL ID, or Wait Event) and the filter value. Screenshots below. That's it for now. Let me know what you think!